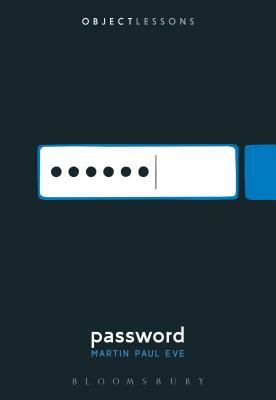 Where does a password end and an identity begin? A person might be more than his chosen ten-character combination, but does a bank know that? Or an email provider? What's an 'identity theft' in the digital age if not the unauthorized use of a password? In untangling the histories, cultural contexts and philosophies of the password, Martin Paul Eve explores how 'what we know' became 'who we are', revealing how the modern notion of identity has been shaped by the password. Ranging from ancient Rome and the 'watchwords' of military encampments, through the three-factor authentication systems of Harry Potter and up to the biometric scanner in the iPhone, Password makes a timely and important contribution to our understanding of the words, phrases and special characters that determine our belonging and, often, our being. Martin Paul Eve is Professor of Literature, Technology and Publishing at Birkbeck College, University of London, UK. He is the author of Open Access and the Humanities: Contexts, Controversies and the Future (Cambridge: Cambridge University Press, 2014) and Pynchon and Philosophy: Wittgenstein, Foucault and Adorno (Palgrave Macmillan, 2014).